Taken in Michigan's Eastern Upper Peninsula. 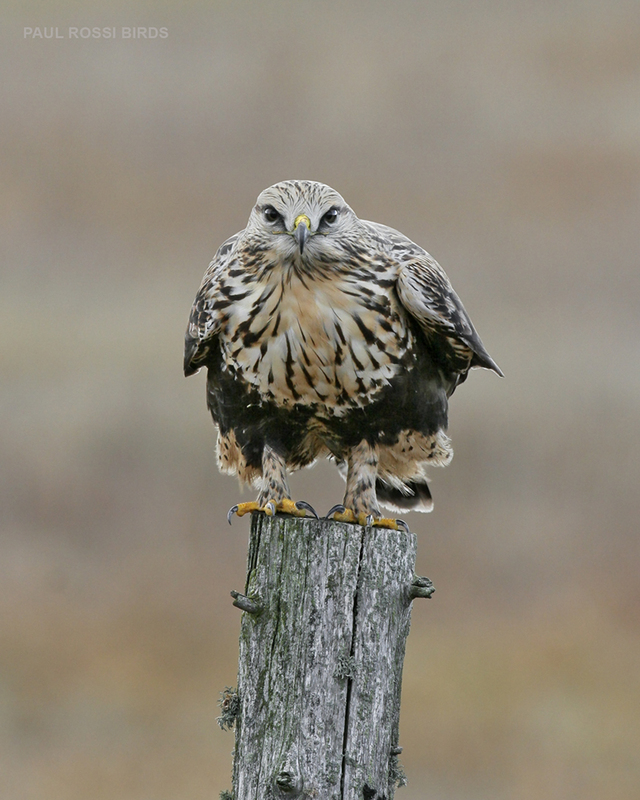 In November when it rains, and this species is migrating south, many Rough-legged Hawks can use the abundant chemical-free hay fields of the region to hunts for voles, and many can become unwary on the posts surrounding the fields. The rain floods the vole tunnels in the fields and they are forced out in the open. A great in-your-face view of the hawk, Paul. Nice showing of the legs and talons. Neat fact about the hunting of voles. How do you manage chemical-free hay fields in your area? They burn the hay fields in the spring, and harvest them once or twice before it gets too wet in the fall. Nothing else. Its highly valued hay, fed to race horses. The voles attract a good variety of raptors. You are fortunate, Paul. Thanks for the information. Great image. I never been able to get close to this specie, great catch Paul and nicely frame ! I love these hawks. We get them here in the winter. Nice front view shot Paul! Good story and excellent head on shot. Beautiful face view here,like the stare,lovely image Paul. Paul, The size of their feet is impressive!